Join our Facebook group for our latest updates! Tap/click here. Preparation was different this time. 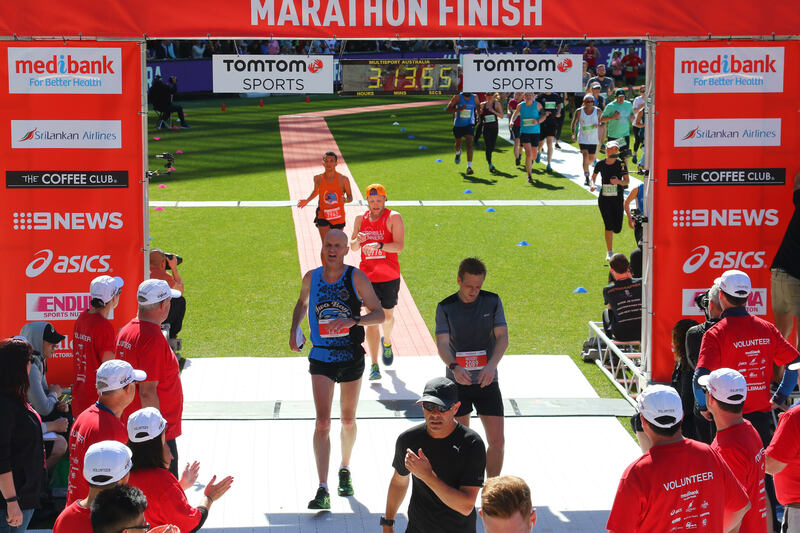 After some peer group pressure and a bit of FOMO, it was locked in and I was headed to Melbourne in 23 days to run my 2nd Melbourne Marathon and 6th (road) marathon. Having come off Sunshine Coast in August, the number of long runs was limited; however, I had miles in the legs after a big year of running. 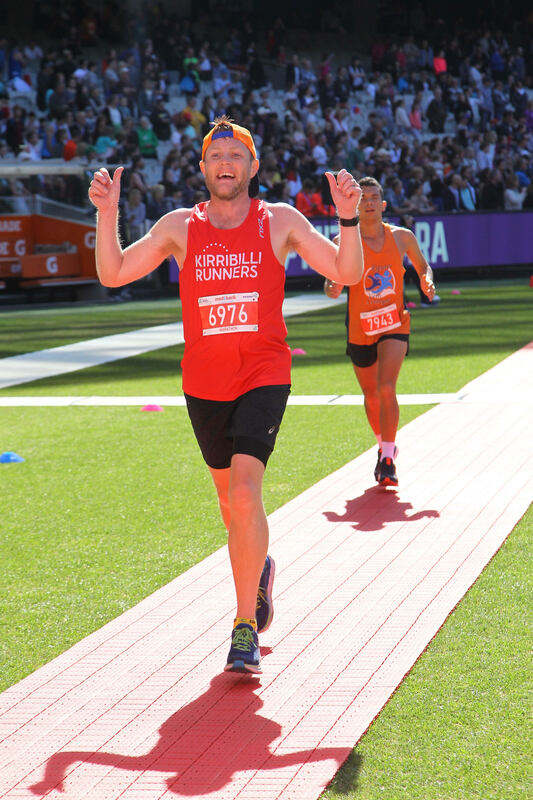 The test would be whether I had the legs to carry the pace through to 42.2. Could I keep my record intact and continue to PB these beasts? Sunday 15th arrived—a quick shower, porridge, tram to Fed Square, and a short walk to the “G.” Excitement was building and the G looked spectacular. Nice cool morning with blue sky. A quick pit stop and off to the start line, where I caught up with running pal, Enrique, another mate, Matt (who was pacing the 3.20 bus), and we were off. The course leads runners past Federation Square and out through St Kilda Road. After a quick chat to the 3.10 pacer, I settled in and was in Albert Park in a blink. The pace was comfortable. The tactic was to go out with or slightly ahead of the 3.10 pace bus and then hold on for dear life over the last 12ks. Coming out of Albert Park, a quick cheer of encouragement from fellow KR Josh and I was running along the bay. It is at this point that you get a perspective of other runners as we switch back around the turn. I was well placed ahead of the 3.10 pacers and was able to enjoy the run and see many other running buddies from Sydney Striders and SHR (Sydney Harbour Runners) as we headed to Elwood. Coming through 21 at just over 1.33, I questioned whether the pace was too quick. The bay wind was abnormally light today, making the race easier but also warmer than expected. At about 25km, I joined up with Sydney Strider Simon, who was, in his words, “foolishly” running only a week after a scintillating 2.44 in Chicago. Simon, myself, and another bloke named Dave (who was running for well-known Melbourne crew Run Like Crazy) held form for a few kms until Dave and I pushed on. The course then leads up the hill and along St Kilda road towards the Yarra. A quick “Hi!” to Josh again and the race “officially starts.” The legs were starting to hurt and I let Dave push ahead, knowing he was aiming to beat a 3.10 PB. 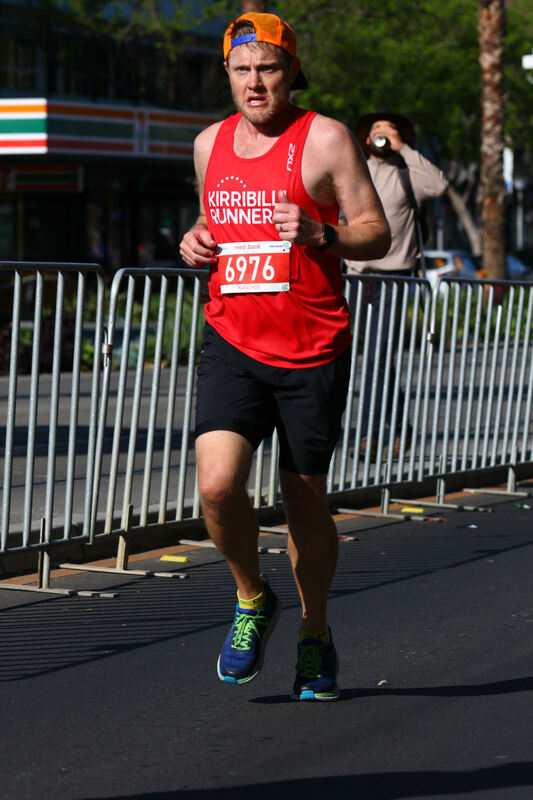 Along St Kilda Road, you rejoin the half marathoners for a while. If there is one thing that is slightly annoying about Melbourne, this is it. Weaving through slower-paced runners is challenging. By now, the 3.10 pacers had caught up and passed by; however, I wasn’t too concerned. I had to run my race and hold form. At 35k, we veered left at South Bank and under St Kilda Road to the “Tan” to make a long, gradual climb up to pass the Shrine of Remembrance, and then on to Domain Road to loop back around. At 40k, I was closing in on Federation Square and had to give it a push along, not knowing my time but thinking I had enough buffer on the 3.20 bus to get a good result. The last few kms were tough, with a slight but continual rise up Flinders Street. But I felt reasonably strong and my pace picked up to under 5-min pace. Coming into the “G”, I had no idea what time it was. I came around the bend and saw 3.13.00 on the clock. A smile on the face, a quick burst to overtake Mr Orange, and a finish in 3:13:34—a 3-minute PB from 2 months ago and a 9-minute course PB! A great day out. What’s next? I don’t know. I now have a 3.15 Boston qualifier, but the time buffer may be short of guarantee entry. That moment you know you’ve nailed a PB. Cruising around the bay at around 21km. The angry Damon about to tackle the first big challenge at 30k, the St Kilda hill, just before seeing Josh. 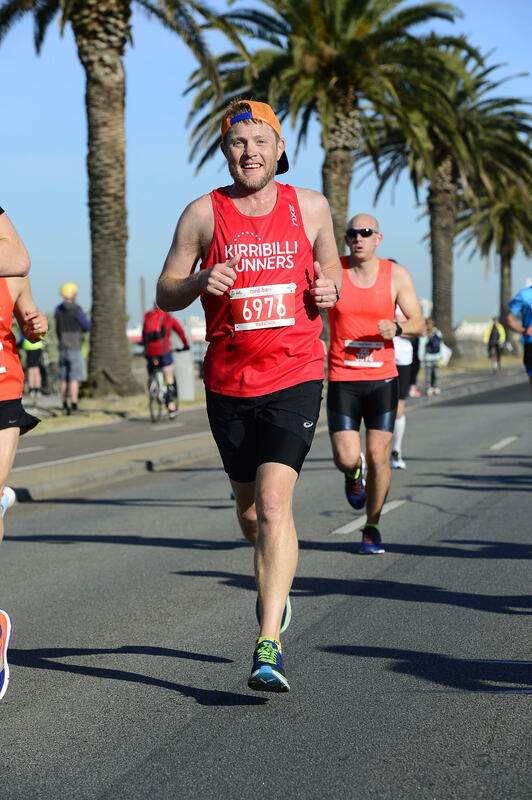 City2Surf 2017: How did KRs fare? © 2017 Kirribilli Runners. Please note that all participation in Kirribilli Runners’ activities is at the participant’s own risk. Site (ver. 1.0) by Chris. Thanks for visiting!